It is always enjoyable to wear a one-of-a-kind piece of jewelry, and it's even more fun if you are wearing something that you made yourself. 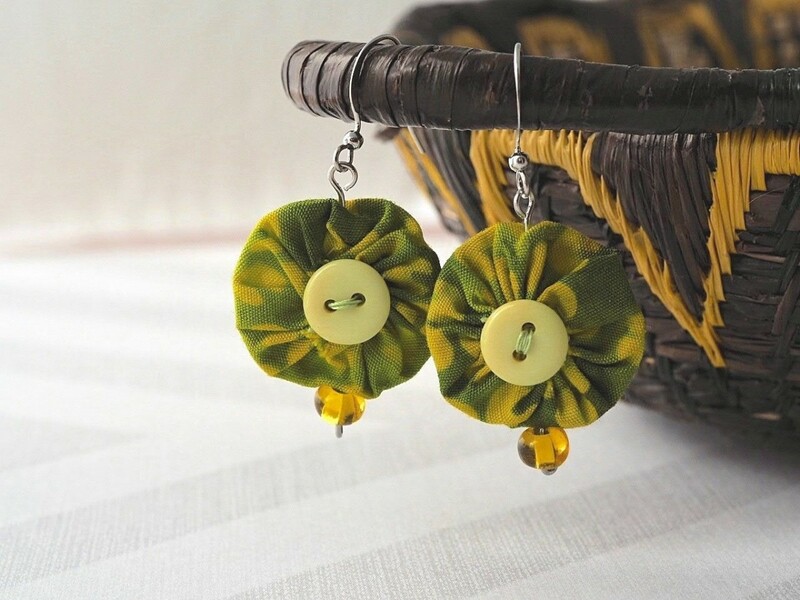 These unique yo yo earrings, made out of fabric scraps, buttons, and beads, are an easy and inexpensive way to show off your own unique sense of style. 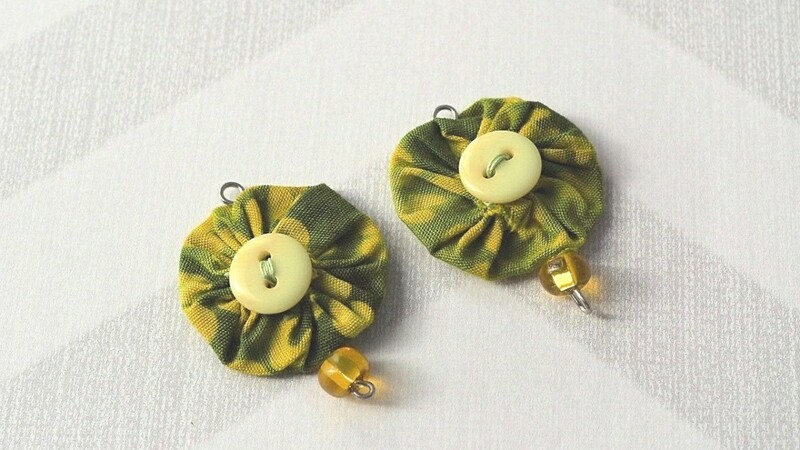 I created these when I needed something a little fun and flirty to match a new outfit. 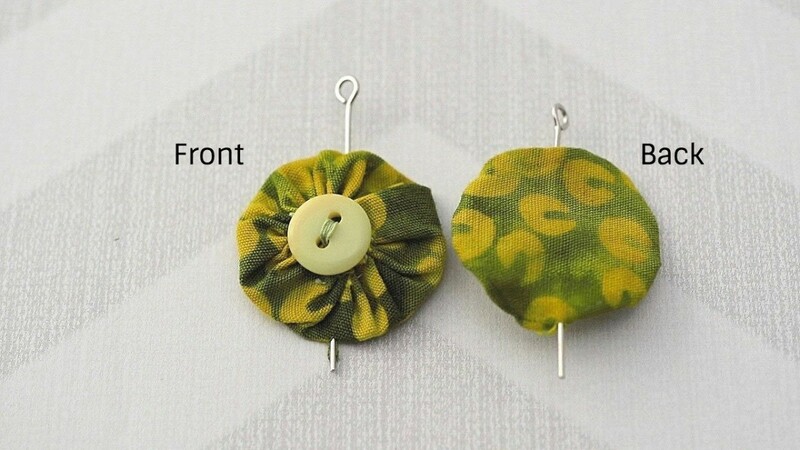 I thought the green and gold batik fabric had a soft, earthy look to it, and that was exactly what I wanted. 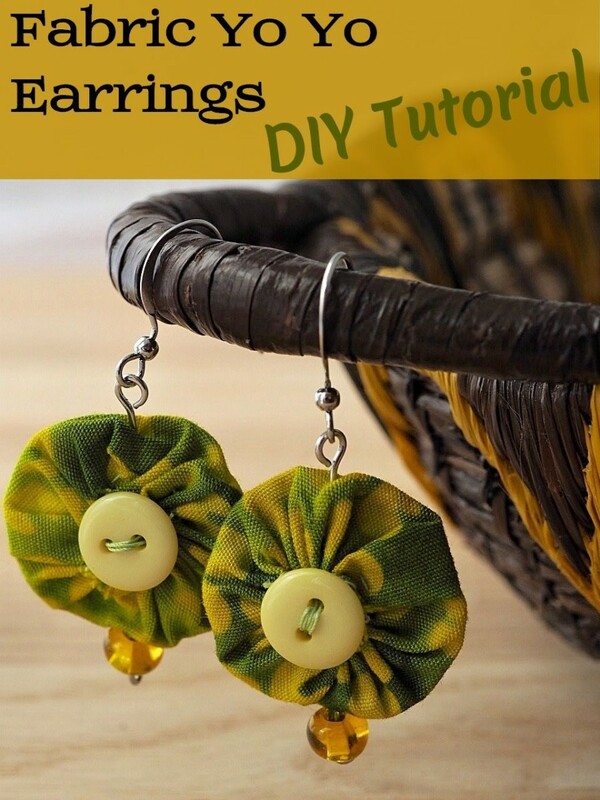 You'll find that these earrings are easy to make with this step-by-step tutorial, which includes a list of everything you'll need, photos, and written instructions. There are even some suggestions for ways you can show off some spirit for special occasions. 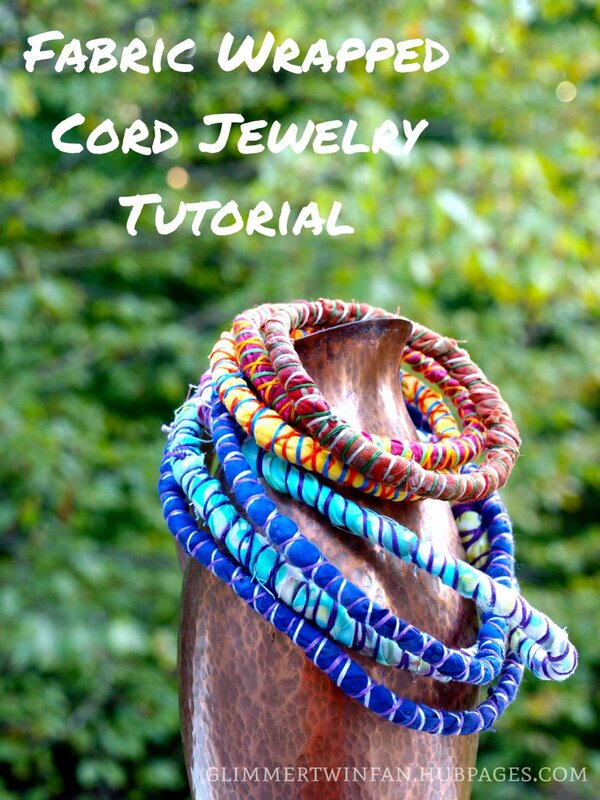 Along with the other items, you will need some basic jewelry making supplies. I didn't use anything expensive. I have a kit like this one which has everything I need. 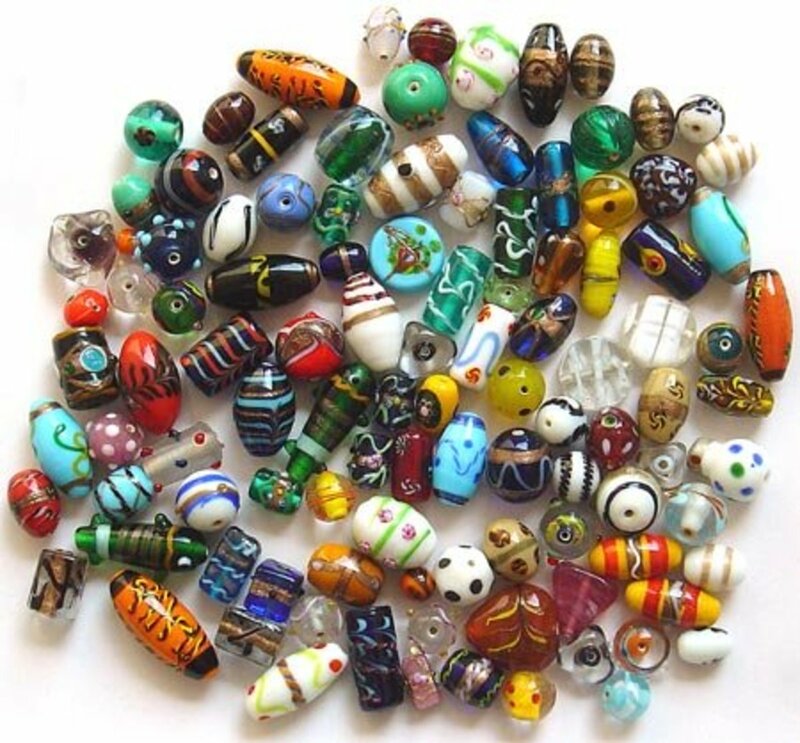 I also have extra jewelry findings in various sizes. I used a batik that is 100% cotton. I find that batik is stiffer than other fabric and holds up well for this project. You'll need two pieces, about 4" square. 2 - Large enough to cover the center of the yo yo, but not too large and heavy. 2 - With a hole that the eye pin will fit through. I keep cereal boxes on hand for templates. Finished earring: From the top of the hook to the bottom of the bead is approximately 2". Circle template: Measured 1 1/2" in diameter. I used a shot glass. Yo Yos: Finished, measured approximately 1" in diameter. Buttons: Plastic that measured 7/16"
Beads: Glass that measured 3/16"
Cut a piece of cardboard large enough for the circle shape you are using. 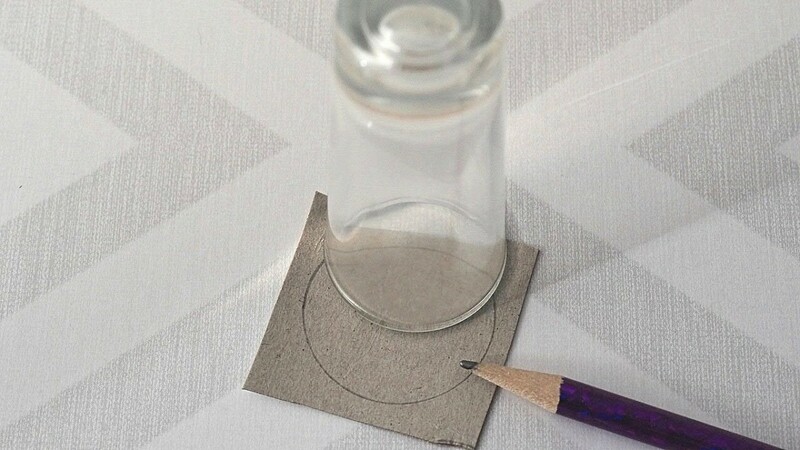 Trace around the circle template. 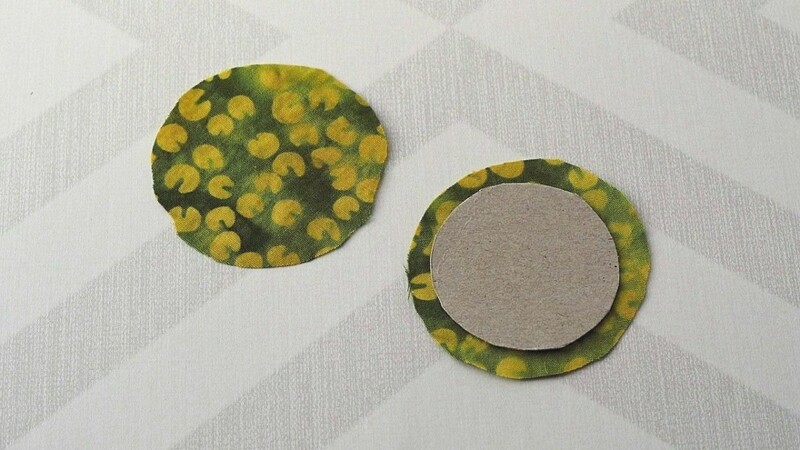 Using the template as a guide, cut a circle out of the fabric, about 1/4" larger than the cardboard. 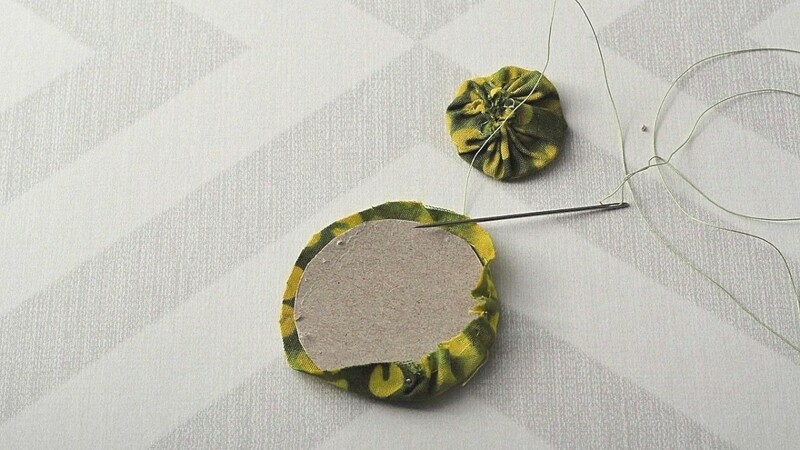 Using a strong thread, and using the template as a guide, sew around the outside of the circle. Tie a knot at the beginning to secure the thread. When you have gone all the way around, remove the cardboard. Don't trim the thread yet. Gently pull both ends, the knotted and the loose one, and close the shape. To get the circle, you may need to manipulate the fabric a bit. Tie a knot to secure the yo yo. 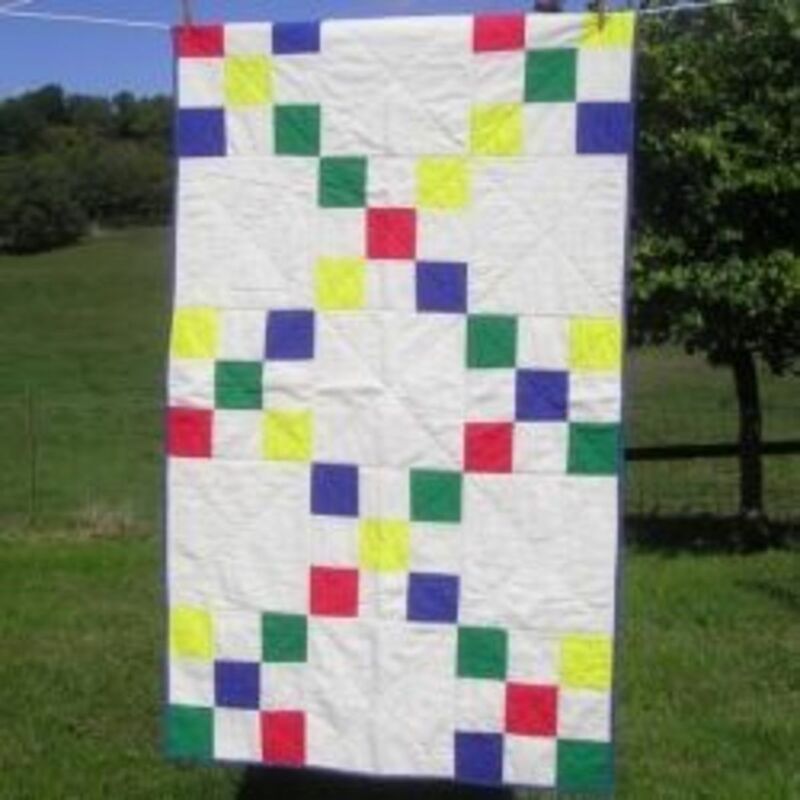 For extra security, you may want to add a couple of extra stitches around the center of the gathered fabric. The video below is a helpful demonstration of how to make a yo yo. Finish up the two yo yos, making sure that they are as symmetrical as possible. You can see that these have raw edges in the center. 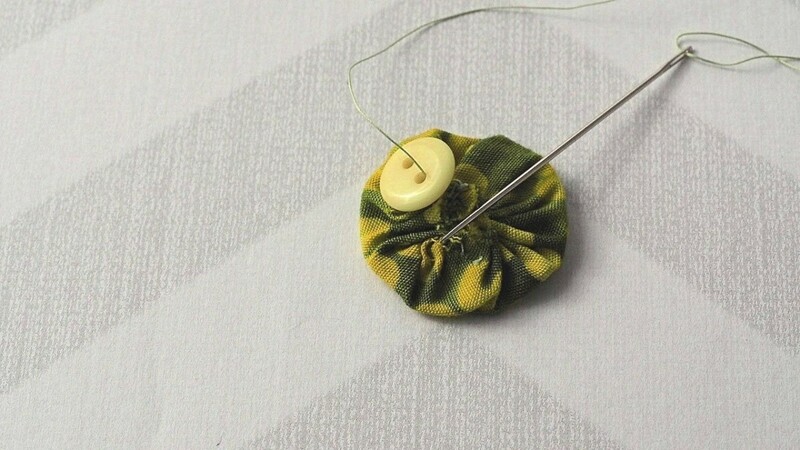 Many people fold the edges under before sewing, but in this case you don't need to. The raw edges will be covered with a button. If you make your yo yos differently, that's ok. Use whichever method you are most comfortable with. 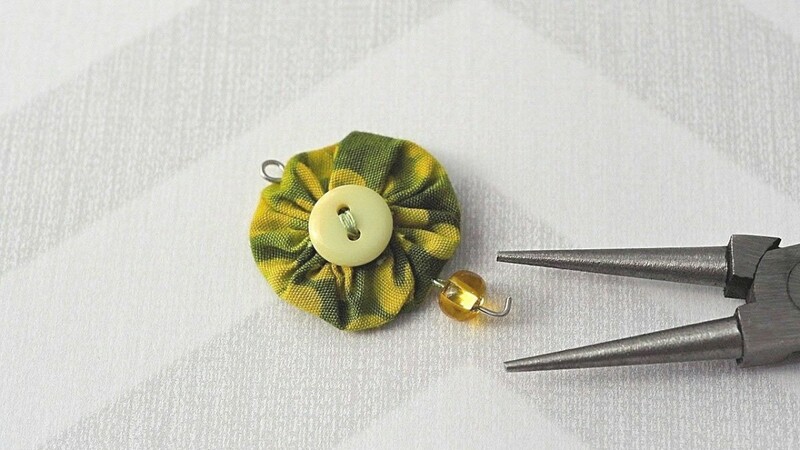 Sew the button in the center. It should be added to the gathered side, not the flat back side, so that the raw edges get covered up. Use care not to sew through to the back side of the yo yo. Gently insert the eye pin through the top of the yo yo, go through the center (between the layers), and come out of the bottom of the fabric. Because the point of the eye pin is not sharp, this can be a bit tricky. 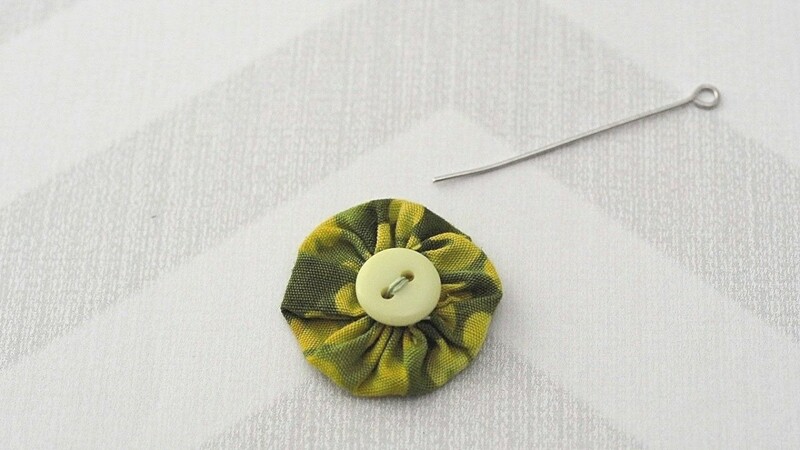 I used a large needle to make a small hole in the fabric, and the pin went right. Use an eye pin that is long enough so there will be room for the bead at the bottom. At the bottom of the earring, thread a bead onto the eye pin. Using the round nose pliers, form a small loop, at the base, to ensure that the bead doesn't fall off. Using the flat nose pliers, gently squeeze the loop closed, so there isn't a sharp end sticking out. This also helps ensure that nothing will snag on the earrings. Repeat on the other earring. Carefully open up the hole of the eye pin. Open it only enough to slip the earring hook on. Gently close the eye pin hole to secure the hook. There you have it! 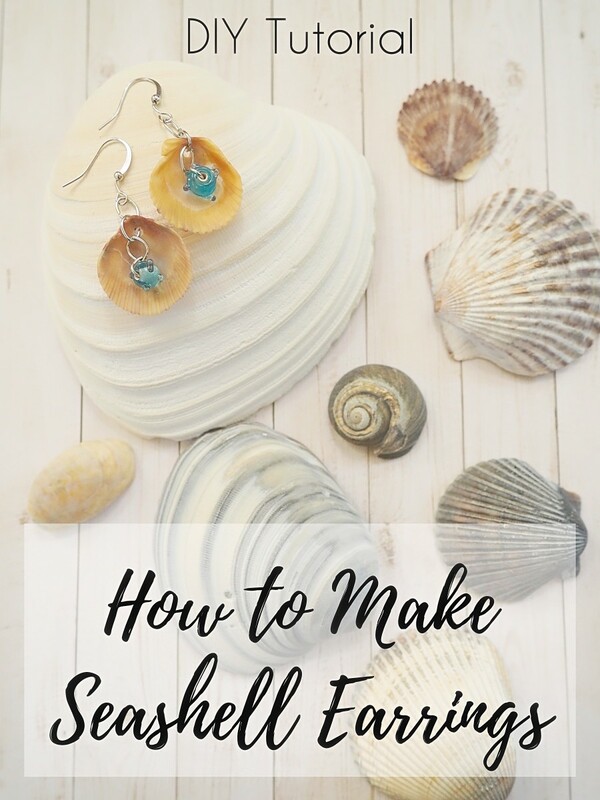 In about an hour, you can make a one-of-a-kind pair of earrings that make a fashionable addition to your jewelry wardrobe. 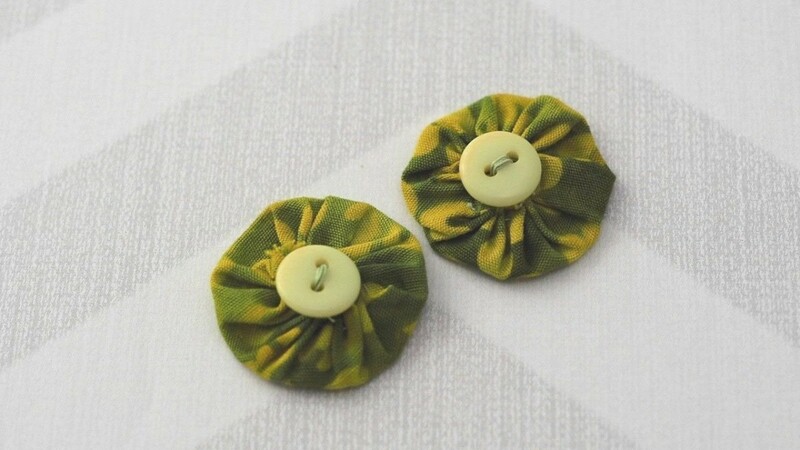 By using various colors and embellishments, you can make a pair exactly the way you want. The possibilities are endless! 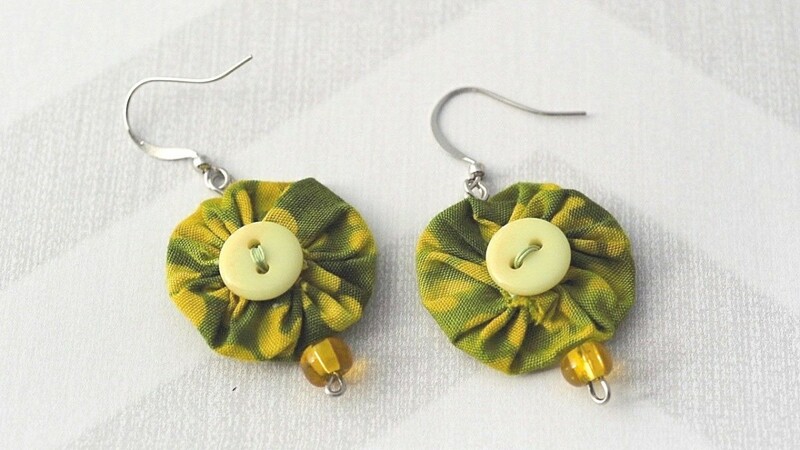 Thanks Dianna - I'm really enjoying these and have made a couple pairs in holiday colors. 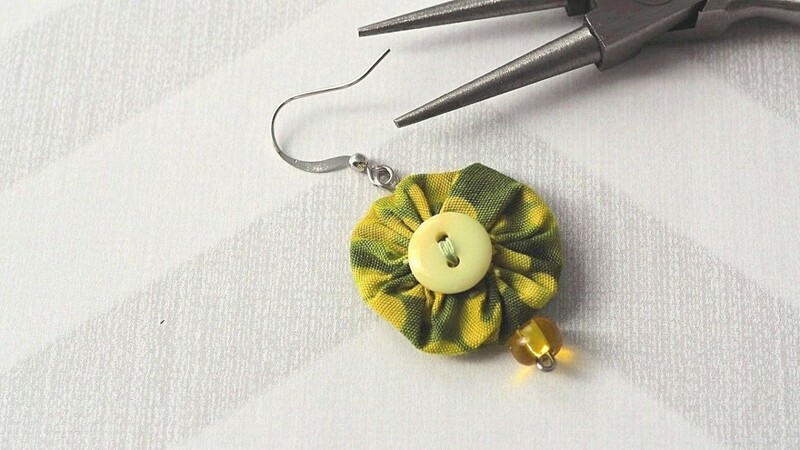 I never would have thought of using fabric to make earrings. Yours look so pretty. I can see how making them for special occasions would not only be fun but very meaningful to the recipient. Thank you for sharing Patricia. 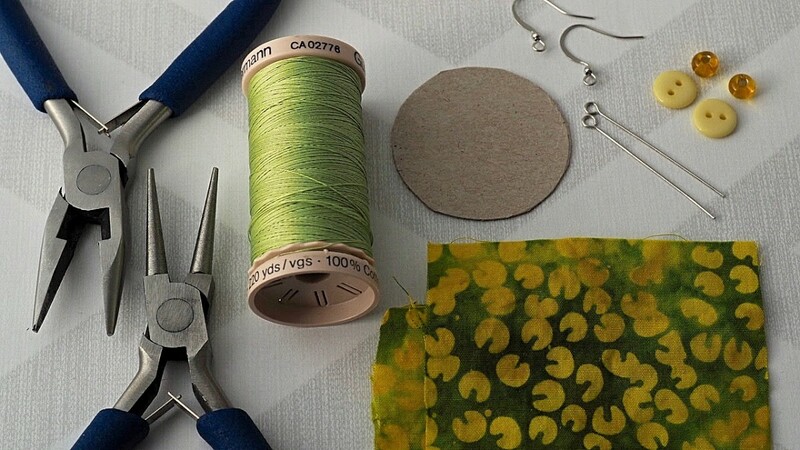 This is such easy hand sewing that most skill levels can handle it. Have a good day! More and more I like to create my own things and I agree, it's not much fun walking around different stores and, even worse, is spending all that time and finding anything. Have a nice day. I appreciate it Louise. Let me know if you make a pair. Thanks Susan. I definitely like having earrings to match every outfit so I'm going to have to make lots more of these. This approach, creating your own, definitely beats trailing round shops for hours to find the right thing. They are really nice earrings, I love them. This is a wonderful tutorial. 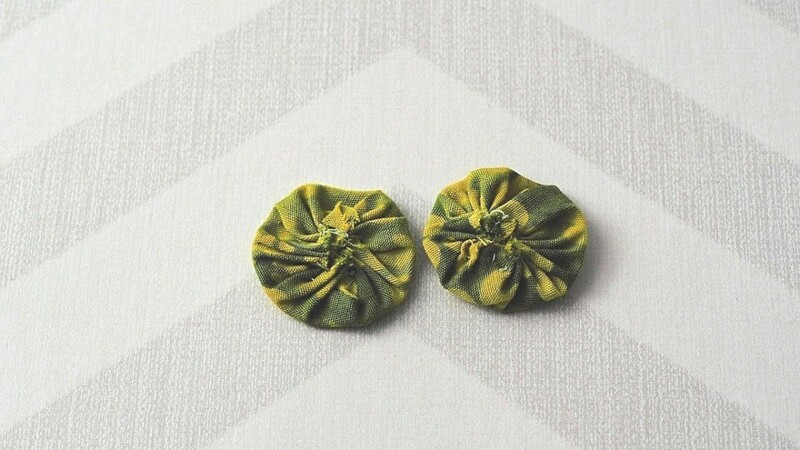 A great idea for someone who likes to have earrings to go with eat outfit.